Diabetes is a metabolic disease in which a person has high blood sugar levels due to the inadequate production of insulin. Proper diet should be followed. Food should be taken at regular intervals which will produce the correct amount of insulin and will keep the blood sugar level in control. If diabetes is not controlled the person is at a higher risk of developing complications. Reassure Diabetic is a complete and balanced low calorie meal replacement. When consumed as a part of healthy diet, it maintains the blood sugar level. Reassure Diabetic provides all the essential nutrients and contains balanced caloric distribution which regulates the insulin levels in the blood, thereby maintaining the blood glucose levels. To prepare a 237 ml feeding, put 200 ml of water in a glass. Gradually, add 6 level scoops (enclosed) or 52 g of Reassure Diabetic Powder, while stirring and mix until dissolved. 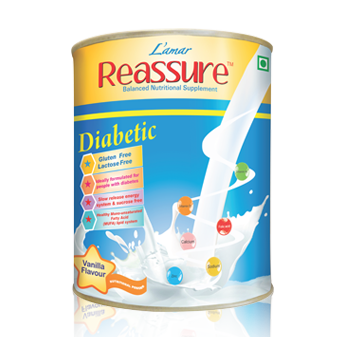 When mixed as directed, Reassure Diabetic provides approximately 0.96 kcal per ml. A 400 g can of powder yields approximately 237 ml servings. Also available in delicious Chocolate and Strawberry flavours.